The J-20’s rapidly evolving combat capabilities could make it a world leading aerial warfare platform. China’s Chengdu J-20 fifth generation air superiority fighter first entered service in early 2017, providing the People’s Liberation Army Air Force (PLAAF) with an analog to the U.S. F-22 Raptor. The platform was the first fifth generation fighter to enter service anywhere in the world outside the United States, and came equipped with state-of-the-art radar evading capabilities, avionics, and air-to-air missiles. The fighter’s canard configuration served to further enhance stealth capabilities while maintaining high levels of maneuverability. With less than a year having passed since the J-20 was inducted into service, the next generation platform has already received its first set of upgrades aimed at enhancing its combat performance. These upgrades are but the first of many to come, which could well lead the J-20 to become a world leading aerial warfare platform. A notable shortcoming of prototypes and early production models of the J-20 was their use of fourth generation engines, the WS-10G, which were heavily based on the Russian AL-31 used to power fourth generation heavy fighters. The platform lacked an engine comparable to the F119 used by the F-22 Raptor, leaving it underpowered and significantly less capable in an air superiority role. 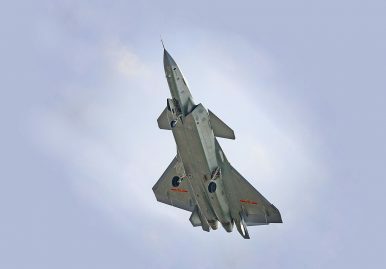 China’s military aviation industries have since the induction of the fighter however developed a fifth generation fighter engine, WS-15, with analogous capabilities to the F119. These new and superior engines will be installed on future fighters and represent a significant upgrade over previous capabilities. Reports from a number of analysts indicate that several J-20 fighters which took part in major military drills at the Zhurihe base in Inner Mongolia in mid 2017 were already equipped with the WS-15 for testing purposes. Other upgrades for the J-20 include improved software, improvements to radar capabilities, enhanced avionics and superior electronic equipment. A lead engineer working on the J-20, speaking to the People’s Daily, said his team were making further modifications to the elite fighter’s engine, stealth coating and weapons bay. This would improve the platform’s flight performance, survivability, and firepower. The rate at which the J-20 has received upgrades is particularly significant when compared to the rate of upgrades for the F-22 Raptor, which has yet to complete installation of its second set of upgrades after almost 13 years of service. Upgrading the J-20’s weapons bay in a number of months, for example, represents an accomplishment the U.S. Air Force has attempted for years to achieve to improve the firepower of the F-22 and allow it to operate more advanced air to air missiles. F-22 upgrade programs such as the Raptor Agile Capability Release have taken years, not months, to implement and arguably are less significant than the upgrades China was able to so quickly apply to its J-20. By the time the U.S. Raptors have all been equipped with the new 180 km range AIM-120D air to air missiles, the J-20 is likely to have already begun to operate the new ramjet powered variants of the PL-21 and PL-12D air to air missiles with higher speeds, maneuverability and ranges estimated at 200-400 km. The pace at which the Chinese fighter’s capabilities are improving far exceeds those of the F-22. The U.S. Air Force’s ability to improve the capabilities of the Raptor is limited largely due to the termination of production of the fighter, meaning it is no longer a “live program” undergoing continuous development in the same way as the F-35, F-15, and J-20. The age of the Raptor’s design, meaning it uses software and computer architecture developed in the 1990s with a core processor speed of just 25MHz, further complicates upgrades – causing particular issues when attempting to equip the fighter with newly developed weapons systems. The J-20’s far newer computer architecture is far easier to work with for China’s own military. While the J-20 was considered unable to match the capabilities of the F-22 upon its induction into service, the far faster rate at which upgrades can be applied are set to rapidly narrow the gap and could well lead the Chinese fighter to soon surpass the capabilities of its U.S. counterpart and in future go on to transcend them entirely. With both fighters representing the elite of each country’s respective aerial warfare capabilities, this will inevitably have significant implications for the balance of power in the Pacific.